When backing up my phone via a mapped network drive Anytrans ends with backup failed error code 42. If I backup to my local PC drive everything works fine. Any ideas why error code 42 appears during mapped drive backup? Also, where does Anytrans store the backup paths? Registry or in a file somewhere? Dear, Member, thanks for using our app and i am sorry for the delay reply. Backup process will be influenced by the size of your data and the network. Given this situation, to help us make better analysis and find solution for you soon, would you please kindly send log to Support@imobie.com for better analysis? Thank you so much for your kind understanding and feedback in advance. ZIP file has been emailed. Dorothy .. any way to correct the SUBJECT or TITLE of this to the correct error code of 41? None of your email accounts could send to this recipient. File resent .. waiting to see if it bounces. Dear, member, thanks for your kind feedback and i am sorry for the delay reply due to holidays vacation. It will be appreciated for your generous forgiveness. I check this issue with our Support Team. They tell me that they receive the log you sent. And our Development Team will analyze the log you sent and provide you with solution soon. They have replied and stated that my network drive does not have enough space. I responded that this is incorrect, the network drive is a 4TB drive and has 2.9TB free - no user quotas, and the full 2.9TB is available to the application/user. I have cleared all my backup logs and will be running a new back up to provide them with new logs, from a single back up to avoid further confusion. I am assuming the initial confusion is based upon logs from the beginning where Anytrans tried to backup to my local drive which at the time did not have enough drive space available. I will update once this has all been completed and they review the logs again. Thanks for your kind feedback and i am sorry for the delay reply. I check this issue with our Support Team. And here are the solutions they provided. Would you please kindly give it a try? I truly hope your issue can be solved with these solution. Thank you so much for your kind feedback and cooperation again. It doesn't solve the main issue which is that the backup errors out with error code 41 when using a mapped network drive. Development is supposed to be working on this issue at the moment. The question that was never answered was where the information for the backup file location is stored by Anytrans. When you first install Anytrans, then select BACKUP MANAGER, since there is not a backup present, Anytrans requires you to backup your phone first. This defaults to a path under the user profile on the local hard drive. This also applies if you have backed up your phone once, but deleted the backup file. Where is the backup path stored by the application? Can it be changed somewhere before the initial backup is performed? 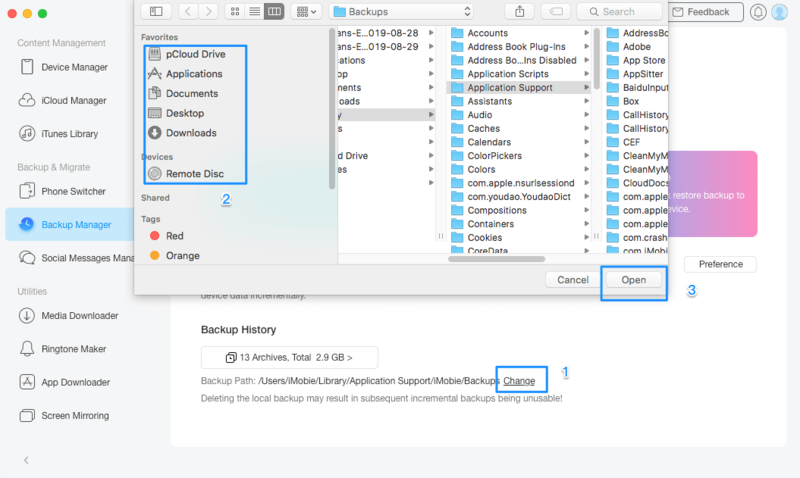 QUESTION FURTHER EXPLAINED: If you have a backup or if Anytrans finds an old backup in iTunes, you can go in and set the backup path location to a different location. However, if you have a new install and no backups available, how can you change the default backup path prior to performing a full backup? Thanks you so much for your kind feedback. Yes, our Development Team will work on this issue. It will be appreciated for your kind understanding. Would you please kindly give it a try? Thank you, but I already know where the default backup path is located. I want to know if it can be changed prior to doing the inital backup. Part 37. How to change the backup path with AnyTrans? 1. Open AnyTrans > Click the Backup Manager icon on the interface. 2. Click the Settings button > Click “Select” option. 3. Select the path you want to save the backup > Click Open > Click Save. However, the SETTINGS option is not available UNLESS there is already one backup. Actually, this screen is not available until the first backup is taken successfully. How can I change this path prior to doing the first backup? Thank you so much for your kind patience on this issue. Yes, you can change the backup path under settings. Given the rare situation you encountered, i will report to our Development Team and send solution to you on tomorrow. Thanks again for your kind help and cooperation on this issue. Thank you so much for your kind patience with this issue. Yes, if you are using Device Manager function, the setting function can only be cuased after you have one back up at least. The good news is that we will optimize this function in our next version of AnyTrans soon. It will be appreciated for your kind patience. After that, you will change this path prior to doing the first backup. Please kindly tell us whethter it works for you or not.